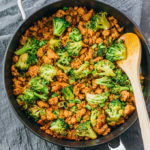 An easy stir fry with ground pork, broccoli, and a simple sauce. Low carb and keto friendly. Pat the ground pork dry with paper towels, if moist. Add ground pork to a large bowl, and evenly sprinkle with corn starch. Use your hands to work it in until well-mixed. Set aside. Heat vegetable oil in a wide pan over medium-high heat for a few minutes or until hot. Add ground pork to the pan and cook until no longer pink, about 5 minutes, breaking it apart as it cooks. Add broccoli to the pan and stir with the ground pork. Add beef broth. Cook until the broccoli is nearly tender, about 5 minutes, stirring occasionally. If the pan gets too dry, add more beef broth. While waiting for the broccoli to cook, add and stir sauce ingredients in a small sauce pan. Place over medium-low heat until it starts to simmer, about 5 minutes, stirring occasionally. Once it starts to simmer, reduce to low heat to keep the sauce warm. Evenly pour the sauce over the pork and broccoli, and stir well to coat with the sauce. Cook for another few minutes or until the broccoli is tender. Turn off the heat. Stir in scallions. Taste and add salt, pepper, and sweetener as needed. Serve while hot. This recipe yields 7.5 g net carbs per serving (1/3 of the recipe).